1874 The Women’s Christian Association formed for the distribution of charity, and the care of the poor and the sick. 1875 The Women’s Christian Association officially incorporated. 1876 Soup Kitchen opened in the Market Square. The Women’s Refuge and Infants Home opened on Grey Street. 1886 Home for Aged Women opened at the corner of King and Waterloo streets. 1888 Responsibility assumed for the Old Men’s Home. 1892 Home for Aged Women joined with Home for Aged Men at the corner of Richmond and Victoria streets. Name changed to Aged People’s Home. 1894 Home for Incurables opened at Hamilton Road and Egerton Street. 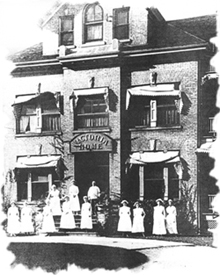 1903 Home for Incurables moved to Dundas Street and renamed Victoria Home for Incurables. 1921 Victoria Home for Incurables moved to Grand Avenue. 1926 Aged People’s Home renamed the McCormick Home for the Aged. New wing added to the McCormick Home. 1927 The Victoria Home for Incurables renamed Parkwood Hospital for Incurables. 1953 Official opening of the West Wing of Parkwood Hospital, replacing the original 100-year-old building. 1964 Sod-turning ceremony held for the construction of the north-east wing of the new McCormick Home. 1967 Official opening of the McCormick Home. 1974 100th Anniversary of the Incorporation of the Women’s Christian Association. 1977 Glassed-in front entrance, beauty parlor, laundry, TV scanners and auxiliary generator added to McCormick Home. 1979 Day Hospital officially opened at Parkwood Hospital. 1980 Parkwood Hospital accepted responsibility for the care of Veterans. 1981 Sketch plans for new Parkwood Hospital accepted by Ministry of Health. 1982 Contract awarded to build the new Parkwood Hospital in two years for $35,549,500. 1983 McCormick Home reconstruction completed. 1984 The new Parkwood Hospital officially opened without debt. 1986 Alzheimer Community Support Services is created at Parkwood Hospital. 1987 Sod-turning ceremony held for the new Western Counties Wing. 1989 Official opening of the Arthur J. Hobbins Building. Official opening of the new Western Counties Wing by Her Majesty Queen Elizabeth, the Queen Mother. 1991 Alzheimer Community Support Services is moved from Parkwood Hospital to McCormick Home and later becomes Alzheimer Outreach Services of McCormick Home. 1995 The WCA receives a Women of Distinction Lifetime Achievement Award for 121 years of service from the YMCA-YWCA. 1997 Mayor Dianne Haskett proclaimed June 18-25 Women’s Christian Association of London Awareness Week. WCA is ordered by the Health Services Restructuring Commission to relinquish to the St. Joseph’s Health Centre the ownership, operation, management and control of Parkwood Hospital. 1998 McCormick Home is designated a “D” facility by the Ministry of Health Long Term Care Division, requiring a rebuild or major renovations. 1999 Wellspring London and Region formed as a division of the WCA. 2000 The WCA commits to rebuilding McCormick Home. 2002 Site selected for new McCormick Home and Alzheimer Outreach Services. 2004 Sod-turning ceremony is held for the new McCormick Home. 130th Anniversary of Incorporation of the Women’s Christian Association. 2006 The new McCormick Home is completed and officially opened at the corner of Oxford Street and Kains Road. 2008 Wellspring London and Region expands to provide additional program space and improved accessibility to all programs. 2011 WCA facilitates Wellspring London and Region’s transition to a stand alone charitable organization and enters into a service agreement with the YMCA of Western Ontario. 2012 WCA announces its ten-year goal to be a leader in dementia care. 2015 WCA changes its public name to McCormick Care Group. 2016 McCormick Care Group launches new brand identity for McCormick Home and McCormick Dementia Services. McCormick Dementia Research is established.